I always find it hard to wean myself off sweet treats after the Christmas holidays. So this year I decided to make myself a treat that would satisfy my holiday sweet tooth, while easing me back into a pattern of healthy eating. Dark chocolate is one of those things that I can only eat in small amounts, so it was the perfect choice. With that in mind, I set about to try my hand at making dark chocolate bark. 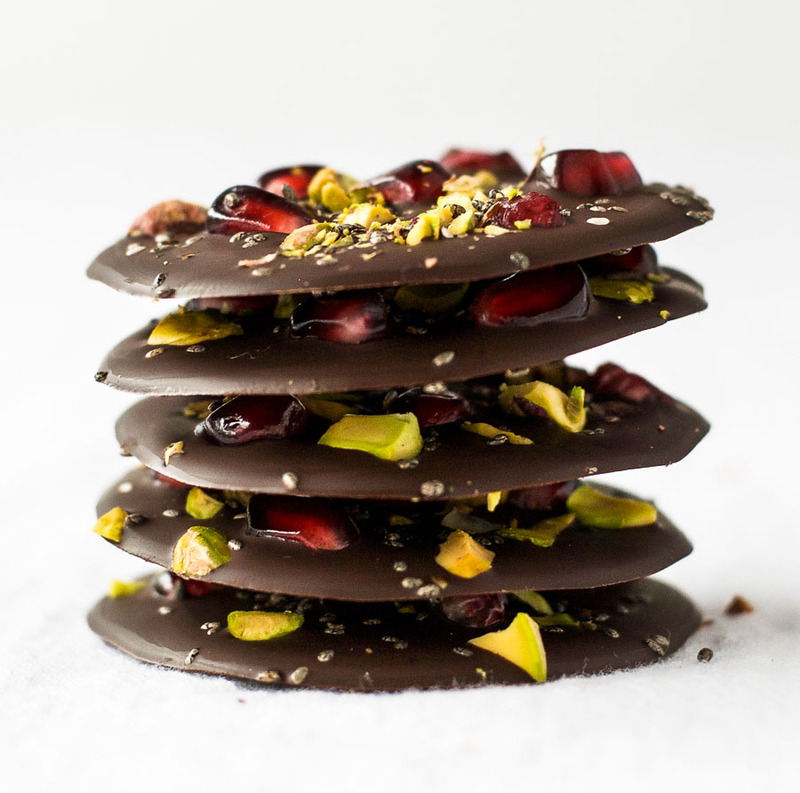 Originally I was going to make it with cranberries and almonds, but after buying my very first fresh pomegranate, I decided to change the recipe to pomegranate pistachio chia chocolate bark. What a mistake that was. Here is the problem. As you devour a piece of this bark, cracking the cold chocolate with your teeth, the pomegranate seeds burst in your mouth shooting sweet juice all over your taste buds. The combination of bitter dark chocolate and fresh, sweet pomegranate juice is truly amazing. Where is the problem, you may ask. Well, my plan was to make a treat that I would only eat a little at a time. This chocolate bark, however, is completely addictive and you can’t help but take another bite… and another. Dark chocolate is a surprisingly high fiber food. Just 1 ounce of dark chocolate (70-85% cocoa solids) contains 3.1 grams of fiber. That is more than 10% of a woman’s, and almost 10% of a man’s daily fiber needs. It is also a good source of iron and contains plenty of antioxidants. Pomegranate seeds are also a good source of fiber, and a very good source of vitamin C and vitamin K.
Chia seeds are a nutritional powerhouse. In just 1 ounce of chia seeds you will find around 12 grams of fiber. They are also an excellent source of essential omega-3 fatty acids, which have been shown to help lower triglyceride and cholesterol levels, lower blood pressure, act as an anti-inflammatory, and protect against arthritis, cancer, and autoimmune diseases, amongst other things. Pistachios are another good source of fiber, with 3 grams for every 1 ounce of pistachios. They are also a good source of vitamin B6. So despite the fact that these morsels taste like a decadent, heavenly treat, they are in fact chock full of fiber, antioxidants, and vitamin goodness. 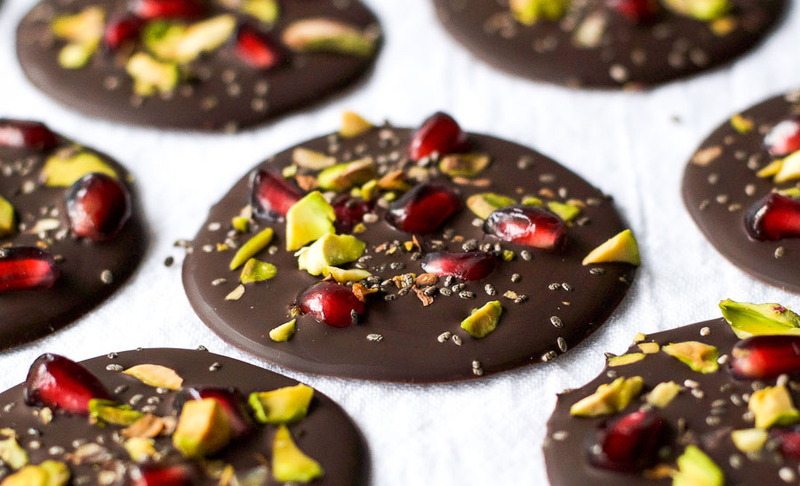 Dark chocolate bark with pomegranate, pistachios, and chia seeds. Break the chocolate into pieces and put it in a double boiler until it has melted (I use a bowl over a pan of simmering water). Alternatively, heat the chocolate in a glass bowl in the microwave in 30-second bursts until just melted. 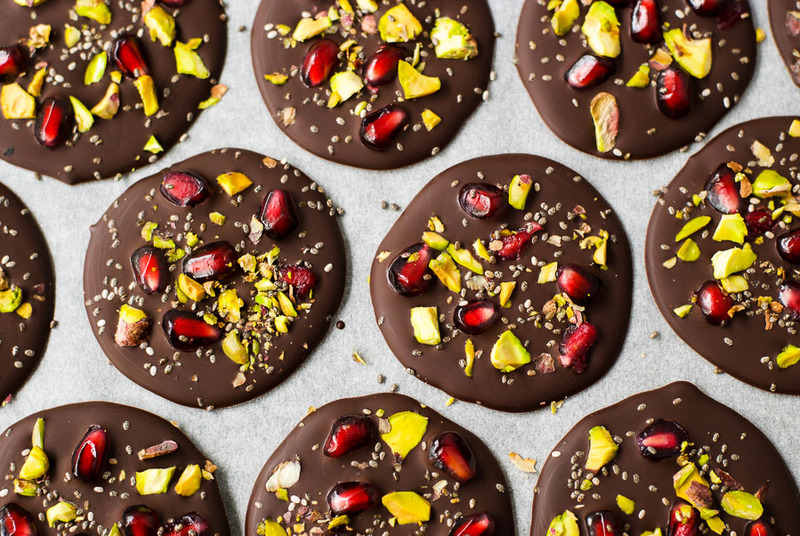 Gently drop a few pomegranate seeds, chopped pistachios, and a sprinkle of chia seeds onto each circle of chocolate. Place the baking sheet in the fridge for 30 minutes, or until the chocolate has set. *If you don't have the time or patience to make individual bites, you can pour all the chocolate onto the parchment paper and sprinkle all the remaining ingredients on top. Then once it has set, cut the bark into bite sized pieces. Very pretty chocolate! 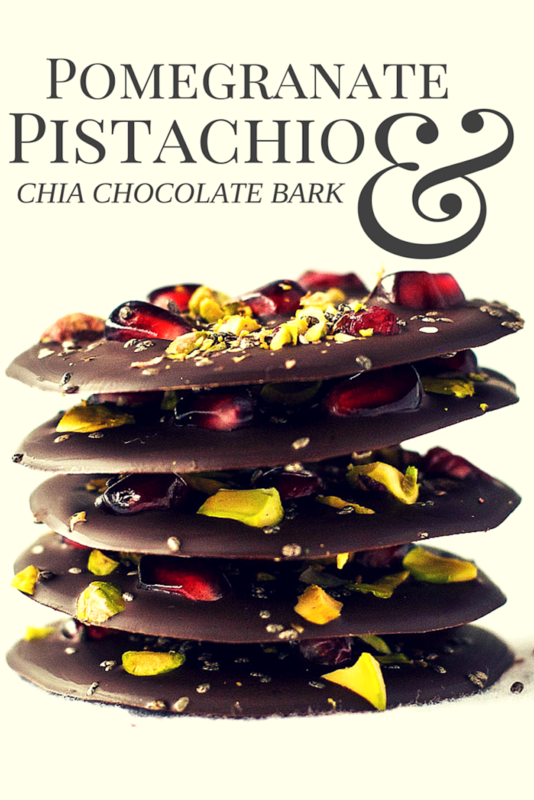 Love the idea of pistachio on chocolate. A healthy touch! Dark chocolate is one of my favourite things to snack on! This chocolate bark is stunning- I love the colours! I usually stick with good old sea salt when I make chocolate bark with the occasional berries, I’ve gotta try it with chia seeds sometime! Oh, these look scrumptious! I love how pure the ingredients are 🙂 Thanks so much for sharing! Pinned! Thank you for your kind comment 🙂 My favorite thing about them is how the pomegranate seeds burst their fruity juice into your mouth as you crack through the dark chocolate.